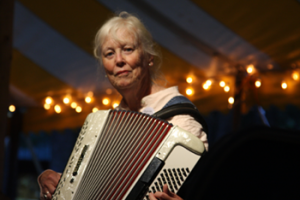 A new Hampshire native, Sylvia has been playing her accordion since college where she began playing for square and contra dancing. Today she plays for contra dancing but also Scottish and English Country Dance. Sylvia was one of the founders of the Strathspey & Reel Society of New Hampshire, a group devoted to learning about and playing Scottish music, open to all ages and abilities and was their music director for 7 years. She says the one thing better than sitting on stage and playing for dancing is helping others learn how to play for dancing.